Slain al Qaeda in the Arabian Peninsula deputy emir Said al Shihri, from his martyrdom video. Image from the SITE Intelligence Group. Al Qaeda in the Arabian Peninsula has confirmed that Said al Shihri, its deputy leader, has been killed in a US drone strike. 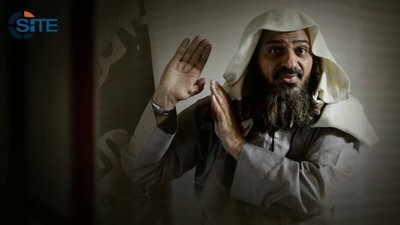 Although the Yemeni government had reported six months ago that al Shihri, a former Guantanamo Bay detainee, was killed in a military operation last year, the al Qaeda commander’s status has been unconfirmed until now. AQAP announced the death of al Shihri in a video that was released on July 16, according to the SITE Intelligence Group, which obtained the video. “The video’s production date is given as Ramadan 1434, meaning that it was made within the past week,” SITE stated. The eulogy for al Shihri was given by Ibrahim al Rubaish, a leading ideologue and theologian for AQAP who also is a former Guantanamo Bay detainee. Al Rubaish confirmed that al Shihri was indeed killed in a US drone strike. Al Shihri, whose real name is Abu Sufyan al Azdi, was first reported killed in mid-January by a Yemeni journalist and by jihadists closely tied to AQAP [see Threat Matrix report, AQAP deputy emir Said al Shihri likely killed in US drone strike]. Just days after reports of al Shihri’s death emerged, the Yemeni government issued an official statement confirming his death [see LWJ report, AQAP deputy emir Said al Shihri is dead: Yemeni government]. The US, however, refused to go on the record and officially confirm the death of al Shihri. In April, AQAP released a statement from al Shihri, and referred to him as if he was alive. Al Shihri is thought to have been wounded in a drone strike in late 2012, and then later died of his wounds. The date of the operation in which al Shihri was wounded is unclear. The Yemeni government claimed he was wounded in an operation on Nov. 28, but family members said he was wounded in mid-December. No drone strikes were reported in Yemen between Nov. 8, 2012 and Dec. 23, 2012. The US is known to have conducted a strike in Saada on Oct. 28, 2012, however. In that strike, US drones targeted two compounds, killing four AQAP fighters, including two Saudis [see LWJ report, US drones kill 4 AQAP fighters in rare strike in northern Yemen]. Al Shihri’s death highlights the difficulty in confirming reports of the demise of al Qaeda leaders and operatives in drone strikes where no government presence exists. Al Shihri has been falsely reported killed or captured several times in the past. Most recently, on Sept. 10, 2012, the Yemeni military claimed that he was killed in a military operation. Al Shihri released a statement on Oct. 20, 2012 in which he denied the reports of his death. In February 2011, he was rumored to have been killed while working with explosives. In January 2010, Yemeni officials claimed that al Shihri was captured. And in December 2009, al Shihri was said to have been killed by a US cruise missile attack. Intelligence services often are unable to reach the scene of a strike and recover a body. Without having a body on which forensic tests can be conducted, intelligence services are reliant on tips from family members and jihadists, media reports, and other methods to deduce if an al Qaeda member has been killed or dodged a strike. In the absence of a body, confirmation via a martyrdom statement is one of the best ways to determine if an al Qaeda operative is dead. Shihri is a Saudi citizen who was detained by the US in Afghanistan in 2001 and transferred to Guantanamo Bay in 2002 for his connections to al Qaeda. He had served as an “al Qaeda travel facilitator” in Mashad, Iran, where he would help al Qaeda operatives enter Afghanistan. He was also connected to the Saudi ‘charity’ al Wafa, which has been designated under Executive Order 13224 as a terrorist organization and is briefly mentioned in the 9/11 Commission’s report as an al Qaeda front. In November 2007, Shihri was released from Guantanamo and placed into Saudi custody, where he then entered a government-run rehabilitation program for former jihadists. Less than a year later, in September 2008, Shihri played a direct role in al Qaeda’s attack on the American embassy in Sana’a, Yemen’s capital. That attack killed 10 civilians, along with six terrorists. In February 2009, when al Qaeda in Saudi Arabia and al Qaeda in Yemen merged to form al Qaeda in the Arabian Peninsula, Shihri was named as deputy to AQAP emir Nasir al Wuhayshi. For more information on Said al Shihri, see LWJ report, Return to Jihad.